High order backlog and an increasing production rate for various aircraft as well as high penetration are the main drivers for significant composite materials demand in the aerospace industry. The author expects a major rebound in the market, especially in APAC region which is observing high demand for aircraft. Composite materials market is anticipated to grow to 139 million pounds, valued at $5.9 billion in 2033. The report analyzes the aerospace market for all the four regions along with the risk factors and growth opportunities. The aerospace market is segmented by APAC, Europe, North America, and ROW regions. The global aerospace industry has a strong long-term demand for products and services, driven by robust passenger and cargo demand. Lucintel predicts continued growth across all the sectors of civil aircraft. In terms of aircraft units, the majority of deliveries will be in the business jet and single-aisle mainline markets; however, in value terms, twin-aisle aircraft designed for use on longer-range routes dominate the market. The fastest growing segments will be the 200- to 350-seat twin-aisle sector, large regional jets, and very light business jets. The Boeing 787 uses composites for approximately 50% of its total structural weight. Both the Airbus A380 and the 787 contain more than 100,000 pounds of composites per aircraft. Composites consumption in the commercial aerospace industry will be driven by three programs: Boeing 787, A350 XWB, and A380. Although North America dominates the global aerospace market, APAC has a huge and growing demand for aircraft. China and India, the two large and emerging economies of this region, are growing rapidly. The author highlights key challenges faced by the aerospace industry. Decreasing defense budget in North America and Europe will be partially offset by increased defense spending in emerging markets. China manufactures its defense aircraft indigenously. Various aircraft are developed under license and various programs are copies of other countries' defense aircraft. Defense aircraft represent the major portion of India's defense procurement budget. 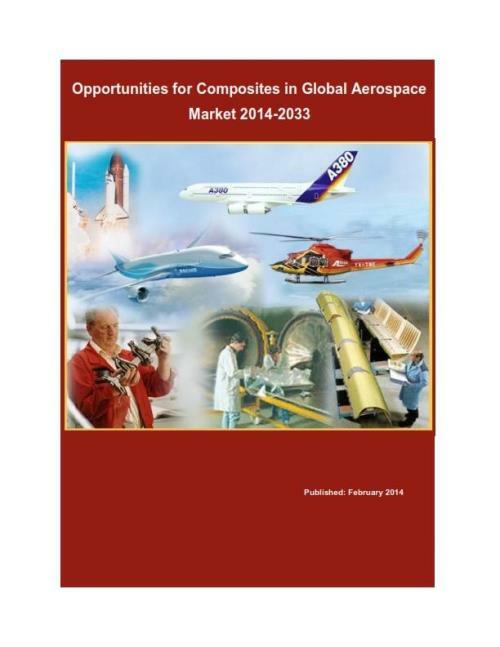 The report is a comprehensive overview of the advanced composite materials market in the global aerospace industry. It provides a top-down view, starting from a useful characterization of the aerospace market itself with accurate breakdown in the main segments and sub-segments (commercial aircraft, regional aircraft, defense, etc.). The report contains detailed figures of the volumes (and associated market value) of composites consumed in the different aerospace segments and subsegments. This analysis also provides technical information regarding composite applications and processes used in the manufacturing of various aircraft components. The report also includes a useful and comprehensive directory of the main players and manufacturers in the industry. To make any investment, business or strategic decisions, you need adequate and timely information. This market report fulfills this core need. This is an indispensable reference guide for composite material suppliers, product manufacturers, investors, researchers, engineers, distributors and many more who are dealing with aerospace industry. - Competitive analysis: Market shares of the industry leaders in various segments of the aerospace market.